A retail brand built from the client out and customer in. Problem: Retail brands are defined at the point of purchase. 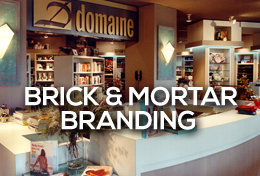 Retail design, signage, display, product selection, return policies, customer service training, all do more to define the brand than the advertising does. The development of a new retail housewares/home furnishings store in a competitive market requires finding a niche unexplored by others.